OklahomaDriver.com has helped over four million graduates become better defensive drivers since 1996.Their online course is reliable, easy to use, and covers all of the necessary instructions to permit you to dismiss any moving violations against you, speedily and automatically. Just use your own user name and password to access the site from anywhere, at anytime, and you can begin your study right where you left off. After completing the final exam, you will be given your free completion certificate that is court accepted all across Oklahoma. It is so easy, just get registered and start taking the course, working at your own pace. 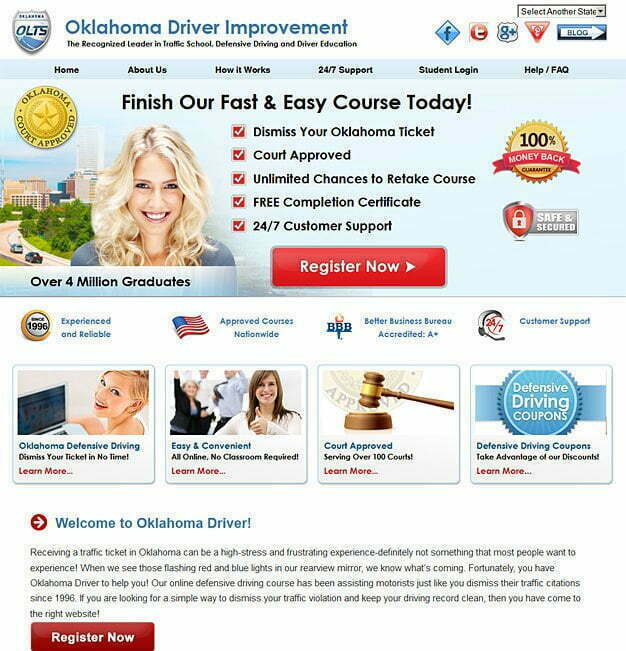 Oklahoma Driver now offers you the same quality instruction online through their web site. You no longer have to sit in a classroom for four hours of instruction with sometimes boring teachers but you can work at your own pace to complete the required four hours of study. Our servers are secure and will log you back in right where you left off. Our site offers a 24/7 customer help to guide you through the course to final completion. The company required a web design that was easily accessible from any location and across any platform of communicating devices. It needed secure servers for logon and needed the ability login to any successive study secessions right where the student had left off. The site has to keep accumulative records of each student’s progress and quiz results and then issue a completion certificate when the course was completed. To meet the needs of our client, Pulse used PHP as a scripting language for seamless communications concerning transactions and database information. For further ease of database management and communications, MySQL was used. Together, these web designing tools made a robust and interactive site that met all of the client’s requirements.